There is an Ansel Adams gallery visiting town that I have wanted to check out, so today, Ian and I and another couple went over and checked it out. The gallery was quite extensive - hundreds of photographs. It was amazing to see the change in technology of the photo paper from the beginning of his work until the end. In the first years of him taking pictures, the photo paper was almost just normal paper. Ian thought this added texture to the photos, but one of the people we were with thought it was ghetto. I was also amazed at how much work Ansel Adams did outside of his photos of Yosemite...the photos I think of when I think of him. He took an extensive set of photos in New Mexico and also did some random photos around Northern California. The photos I was most impressed with were the ones where he was able to capture an entire picture of a cloud, from top to bottom. It is hard to explain, but it added depth to the picture and was beautiful to me...but I am a cloud lover! At the end of the gallery, I hit up the gift shop and bought a postcard to send to my brother (shhh, don't tell him!) because I know he likes Ansel Adams. 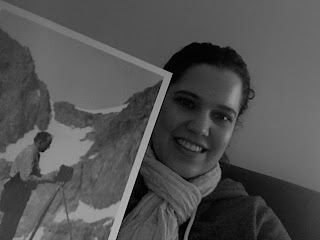 And in case you are wondering, that is a picture of me holding the postcard. While I was waiting in line, I turned the postcard over only to discover it was made in Stockton, CA! Think of the journey this postcard has been on - made in Stockton, CA, sold in a gift shop in Edinburgh, UK, and will now make a trip back to Modesto, CA right into the hands of my brother! Sometimes it is amazing how small the world is! I hate to tell you this but I heard Jeremy talking in the family room and he knows about the post card. Next time you want to keep a secret don't post it on line. Even I'm smart enough to know that rule! That post card is enormous! I too love Ansel Adams, but I've never seen his Northern California stuff. I would love to.